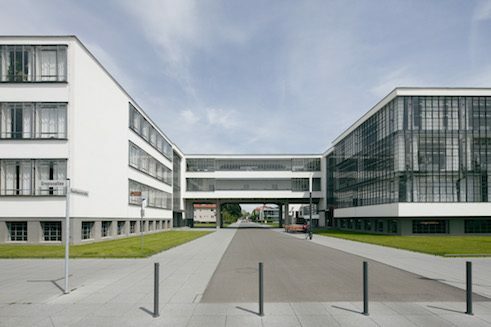 Scarcely any other art school achieved such comprehensive world renown in 20th-century art, architecture and design as the Bauhaus, founded by Walter Gropius in 1919. 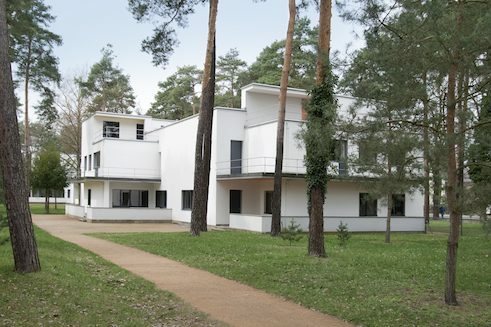 In 1925, the Bauhaus moved from Weimar to Dessau, and here was given its own building with workshops, and residences for the professors, who were called “Meister” (i.e. masters). Today, the Bauhaus with these “Meisterhäuser” (i.e. masters’ houses) in Dessau-Roßlau are a UNESCO World Heritage site. Human beings and technology, the links between industry and science, and the modernisation of the city of Dessau were the new guiding principles of the 1920’s that prompted politicians such as the city’s liberal mayor Fritz Hesse to put out the welcome mat in Dessau for the art school that had been driven out of Weimar. In 1924 initial, preliminary discussions for the move were held with Bauhaus director Walter Gropius and the Meisterrat (i.e. board of masters). Teaching started in Dessau a year later, and the inauguration of the new school building was held in December 1926 with over 1000 guests. As landlord, the City of Dessau provided the funds both for the plot of land on an open space in the north-west of the old royal residency city near the train station, as well as for the new construction of the school building and the Meisterhäuser. The city is still the owner of the Bauhaus buildings in their entirety to this day. Planning for the new construction was in the hands of the firm of Walter Gropius; architects Carl Fieger and Ernst Neufert were involved in the design as chief executives. Bauhaus building Dessau | Walter Gropius | 1925-26 | Photo: Tadashi Okochi © Pen Magazine | 2010 | Stiftung Bauhaus Dessau Gropius had finally gotten the opportunity to construct a school building according to his concepts. The boldness and technically elegant transparency of this debut work, the Fagus Werk in Alfeld, that Walter Gropius and Adolf Meyer supplied with a so called curtain wall, a glass façade suspended in front, also distinguishes the Bauhaus building in Dessau. Geometrically clear and tranquil, the entire complex is articulated into a fluid, overlapping transition of vertical and horizontal links of rendered surfaces, ribbon windows, perforated facades and large-format glass walls. Bauhaus building Dessau | Walter Gropius | 1925-26 | Photo: Tadashi Okochi © Pen Magazine | 2010 | Stiftung Bauhaus Dessau There is, however, no main view. To completely comprehend the building, one must go through and around it. The three-storey glassed-in workshop wing, connected via a two-level bridge that housed office and management spaces with a equally high building section for the school of applied arts and crafts, is particularly concise. A single-storey section with cafeteria, aula and stage mediates between the workshop wing and the five-storey studio building, the so called Preller House, with its precise, jutting balconies. Originally, 28 live-in studios for students and so called Jungmeister (i.e. junior masters) were accommodated here. 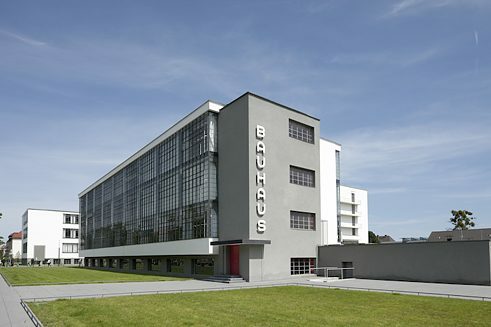 The Bauhaus workshops were involved in the interior design of all buildings. In Dessau, some former students from Weimar took over the workshops as Jungmeister: Herbert Bayer, for instance, directed the workshop for print and advertising, and Marcel Breuer the joinery. Additional workshops included the metal workshop, weaving workshop, wall painting, sculpture and the stage. In Dessau, the Bauhaus pursued an altered programme in which industry and science gained in significance for design. The school endeavoured to manufacture the newly-developed products serially. Master´s houses Muche/Schlemmer | Dessau | Walter Gropius | 1925-26 | Photo: Yvonne Tenschert | 2011 | Stiftung Bauhaus Dessau However, the political shift that came with the assumption of power by the National Socialists in Thuringia once again led to an abrupt end to the school’s operations. As early as 1931 the Bauhaus - as “Moscow’s firebrand” (Alexander von Senger) - was to be closed and demolished. In 1932 the school’s teaching operations were transferred to Berlin, and in 1933 the dissolution was completed following an action by the Secret State Police (Geheime Staatspolizei, Gestapo). The Bauhaus in Dessau remained standing, but was badly damaged by aerial bombing raids during the Second World War. Initial plans for reconstruction by Bauhaus member Konrad Püschel in the 1960’s never got past the paper stage. In 1974 the Bauhaus building was entered into the GDR’s list of landmarks as an historic monument of national and international importance, and two years later a comprehensive reconstruction was initiated. The revitalisation of the Bauhaus concept began with the construction of a centre for research and cultural activity, and has been continued with the launching in 1994 of the Bauhaus Foundation. 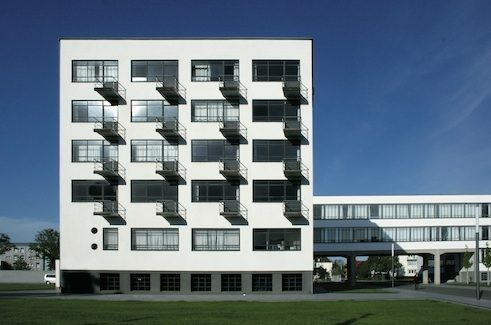 In 1996 the Bauhaus building in Dessau, along with the Meisterhäuser and the buildings in Weimar were entered into UNESCO’s list of World Heritage sites. The Bauhaus Foundation pursues a cultural and research mission, and has dedicated itself to studying, collecting and communicating the Bauhaus concept and the dialogue among architecture, design and art in the 21st century. Over 100,000 visitors from around the world are guests in Dessau each year.